Saturday, September 22 -10:30 am to 12:30 pm, Blue Ridge Parkway, Humpback Rocks Visitor Center, Milepost 5.8. Join hands to protect our land, water, air, communities, and natural treasures from the threats posed by unnecessary, unwanted, and unnatural fracked gas pipelines at our Third annual Hands Across the Appalachian Trail! The dedicated work of hundreds of volunteers, community groups and allies, and dedicated individuals has led to Stop Work Orders and further delays of the Mountain Valley and Atlantic Coast Pipelines. These pipelines propose to cross several nationally known and highly popular public recreational areas including the George Washington National Forest, the Blue Ridge Parkway, the Great Eastern Trail, and the iconic Appalachian Trail. Hands Across the Appalachian Trail is our community response to protect valued natural parks and environment. 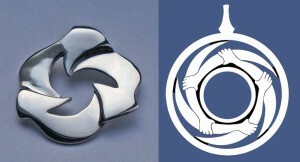 This event will be an opportunity for people to come together and celebrate our treasured natural resources, celebrate victories won by the hard work of dedicated volunteers and legal advocates, and continue building fellowship and momentum around the continued effort to stand against unnatural gas fossil fuel projects and fight for a safe, sustainable future that all can enjoy! Now in its third year this event features the Appalachian Trail Conservancy’s vision to “connect the human spirit with nature – preserving the delicate majesty of the Trail as a haven for all to enjoy.” Everyone should have the opportunity for that experience. Come enjoy food, music, and celebrate our natural resources. 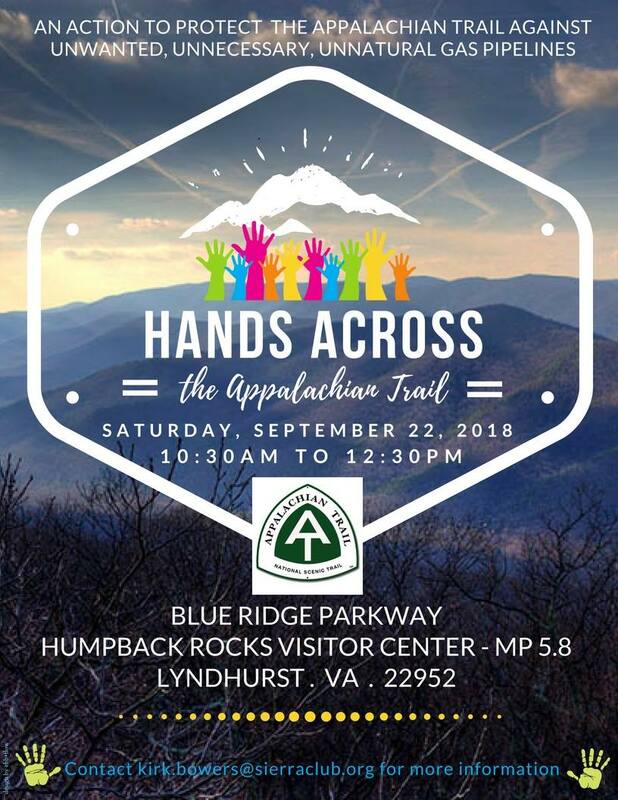 This Hands Across the Appalachian Trail event will take place at the Humpback Rocks Visitors Center in Nelson County. Events will also be held at the Route 100 Trail Head intersection with the A.T. in Giles Countyand at the Bears Den Lodge in Loudon County. For more information, directions, or answers to any questions, contact Kirk Bowers, Sierra Club Pipelines Campaign Coordinator, at kirk.bowers@sierraclub.org. Directions: Take Interstate 64 to Exit 99 at the top of Afton Mountain. Follow signs on Route 250 to Blue Ridge Parkway. Turn right onto Blue Ridge Parkway. Travel 5.8 miles to Humpback Rocks Visitor Center and Picnic Area. This entry was posted in Appalachian Trail, Events, Take Action, Videos on September 15, 2018 by Ellen Bouton.